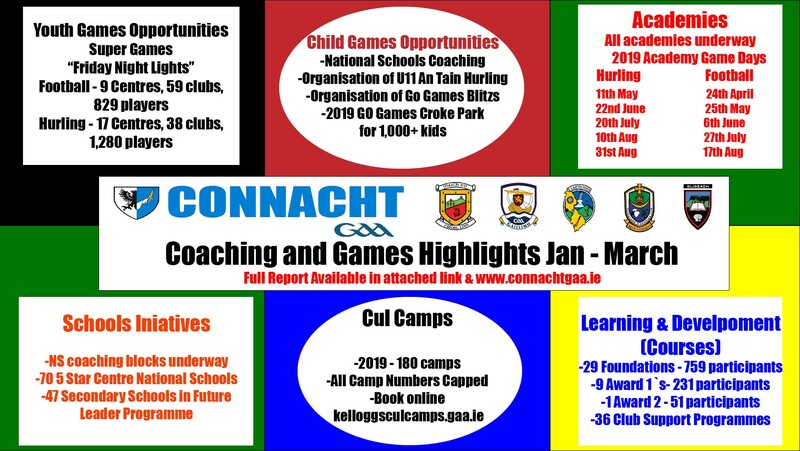 The following is an update of some of the work taking place across Connacht in Coaching and Games from for the 1st Quarter of 2019. It will also include some of the events taking place in the coming months. Coaching and Games is broken up into 6 key areas (Outlined below) which feeds into the National & Provincial Coaching and Games plan. Each county then has a County Coaching plan which is tailored to suit the individual county’s needs in these 6 areas. This is implemented by the County Games Manager, County Coaching Officer, and Games Development staff in each of the counties on a day to day basis. Governance for the plan is over seen by the County Steering Committee which consists of the County Chairperson, Secretary, Coaching Officer, Games Manager, Treasurer & PRO who meet 6-8 times per year to review the plan. Area 6 – Learning & Development. National Go Games Week will take place between Saturday April 13th and Sunday April 28th. Each county will hold a blitz day in the county to launch the Go Games in the county for 2019. The club Go Games program will commence after these dates with start dates varying depending on the county in question. Planning is well underway for the 2019 Connacht GAA Go Games Days in Croke Park which this year take place on April 16th and 17th. Last year 960 children across 48 teams participated from Connacht. This year again 48 teams across hurling and football will take part with between 900-1,000 expected kids to take part, getting the opportunity to experience Croke Park. The players involved will get to play a number of games in Croke Park and get a tour of the Croke Park Museum. This initiative, which was spearheaded by former Connacht GAA Games Manager, John Tobin, first took place eleven years ago and has been an outstanding success. So far, over the eleven years every club in the province have had the opportunity of experiencing Croke Park. An Táin and An Táin Óg Leagues commenced on April 6th and will continue to take place over the coming months. There will be a full breakdown of participation in these events in the next Quarterly Coaching Report. Connacht GAA will host this year’s National Football Féile on June 28th,29th & 30th. All fixtures have been released and can be seen on the following link http://connachtgaa.ie/news/2019-john-west-feile-na-nog-draws-made/ This will be the biggest Féile ever staged in its history and a huge undertaking by the province. There will be 836 games, with 176 Connacht teams and 352 teams in total taking part over the weekend. The National Hurling Féile is taking place in Cork on June 7th, 8th and 9th. Super Games Centres are where small-sided games are provided for youth participants aged 12-17 years on an age-related and developmental needs basis. Super Games Centres in essence can be defined as informal developmental games opportunities where participants oversee the organisation of the game, are youth centred and where the prevailing values of the event are set by the youths. The initiative was originally developed to try and counteract the 49% drop off rate seen across the GAA in the age groups between 12 – 17 year of age. We as an association have to provide formal and informal games for our players that are based around development and enjoyment of the game and not all based around winning. In response to this, Connacht GAA`s Super Games “Friday Night Lights” is an Initiative which was trialled over four nights in December 2018 and January 2019. Over 700 players from 48 clubs across all 5 Connacht Counties participated over the 4 nights. Although the concept is fairly well established in schools, the concept at club level has been slow to take off nationally. Friday Night Lights is one of the first club Super Games run in the country and we are thrilled with the response. The events are for U-14 boys Gaelic Football players that were mixed up into random teams and played 4 x 12minute games where all players played for the whole duration of the games in a variety of positions. The level of positivity surrounding the event has been pleasantly surprising, particularly from parents and the children participating. Due to the demand Connacht GAA in association with the 5 counties expanded the initiative to 8 football and 5 Hurling locations. The information below outlines some of the activities that took place in February and March. There will be more dates and venues occurring in the near future so keep an eye on Connacht GAA Social Media for details as soon as they are announced! Across the province there are 70 national schools taking part in the initiative, which is above the 10% national target set out for the province for this year. For the most part the schools have really embraced the initiative and it is working well. I see this as being a huge project for the Association going forward and I would encourage clubs to give their full support to this project with their local national schools and help them where necessary. The application process for September 2019 is now open and more details can be found on www.learning.gaa.ie/5star Schools that participate in all of the 5 initiatives for a minimum of 1 hour per week and over a period of 26 weeks will be recognised as a 5-star centre and presented with a 5-star centre flag. 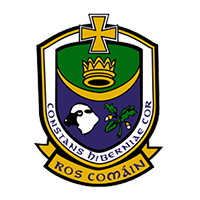 In 2018 through Connacht GAA`s Primary Schools Coaching Programmes across the 5 Connacht counties, 18,522 Coaching Sessions were conducted in total. This averaged at 34 coaching sessions per school. 521 Primary Schools participated in 8 or more coaching sessions with 45,883 pupils participating in these coaching sessions. Our plan is to hit these figures again and hopefully surpass them. All counties are presently undertaking their coaching blocks in the schools. All figures will be given in the next quarterly edition. The introduction of the Future Leaders Programme has been a very positive development in the secondary school sector for the association. It is a further development of the existing TY Programme that has been running for a number of years. The Future Leaders Transition Year Programme is a joint initiative from the GAA and the Professional Development Service for Teachers (PDST). It is a cross-curricular programme comprising of a series of modules designed to encourage maturity, initiative, responsibility and leadership abilities in pupils. 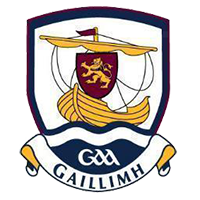 The Programme gives pupils the knowledge and skills to support all roles required for the effective staging of Gaelic Games. As part of the programme pupils are challenged to organise and run a GAA Super Games Blitz or set up a Super Games Centre for younger students and/or support the coaching of younger players in their school or community. The programme consists of 8 modules, varying in length but generally lasting between 6 and 10 hours in duration with each module being stand alone and individually certifiable. The modules cover areas such as the Coaching of Hurling/Football, Refereeing, Administration, Sports Journalism, Analysis, Nutrition, Wellbeing and Event Management. There are at present 47 secondary schools across the province taking part in the initiative with that number set to increase in the coming years. Given the skills that these students are developing at such a young age, if they are linked in with local clubs it can only be a positive for the association in the future. The level of games activity from this programme will be highlighted in the next edition of the newsletter. All camps around the province are now capped so online booking is recommended to guarantee a place. Our County academy/development squads are in initial stages of starting across the province with counties at various stages depending on the age grade. Group Stages Fixtures take place on May 1st,8th,15th,22nd and June 8th. Quarter-Finals take place on June 15th with Semi-Finals on June 22nd and Finals on June 26th. 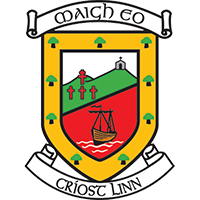 Round 1: Friday 17th May – Leitrim v Mayo, Roscommon v Galway & Sligo Bye. Round 2: Friday 24th May – Galway v Sligo, Mayo v Roscommon & Leitrim Bye. Round 3: Friday 31st May – Roscommon v Leitrim, Sligo v Mayo & Galway Bye. Round 4: Friday 14th June – Mayo v Galway, Leitrim v Sligo & Roscommon Bye. 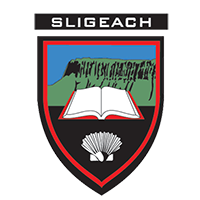 Round 5: Friday 21st June – Sligo v Roscommon, Galway v Leitrim, Mayo Bye. There have been 5 dates set nationally for both football and hurling at U14, 15 & 16 level. The National Academy Hurling Dates are taking place on May 11th, June 22nd, July 20th, August 10th, and August 31st. The Connacht Academy Féile, Niall McInerney, Connolly/Cunniffe (U 13) and National U 15 Hibernian Cup will take place within these national dates. National Academy Football Dates are taking place on April 24th, May 25th, June 6th, July 27th, and August 17th. Sean Purcell U14 blitz days are on May 25th & August 17th. The Dermot Earley U15 blitz days take place on May 18th and August 10th while the Ted Webb Cup U16 takes place on August 15th, 24th and 30th. Since the start of the year 29 Foundation courses have taken place across the province. 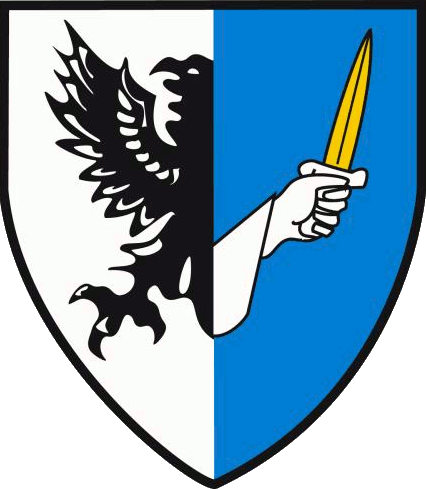 759 participants have taken part in these courses. There have also been 9 Award 1 courses delivered with 231 participants taking part. Our Award 2 course which started in November is now through 4 of the 5 days with 51 participants taking the course. All modules are delivered by our Connacht GAA tutors. These courses are having a hugely positive effect for a large number of players and clubs around the province. The Provincial Club Support Programme is in full swing with 35 out of the 35 selected clubs having started the programme. The primary purpose of the Club Coaching Support Programme is to build self-sufficiency and self-sustainability within each club in all aspects of coaching/management and player development. There has been a great response from the clubs who are taking part in the program. Below is an outline of what is involved in the programme. The recent phenomena of appointing outside personnel to fill management/coaching roles has in many instances had negative repercussions within our clubs. This programme gives all coaches an opportunity to become participant stakeholders in designing/redesigning club coaching policies for the future. This basic engagement will also create a greater awareness of the comprehensive nature of all coaching and games activities. It affords coaches/managers a greater degree of responsibility to decide future direction of player/coach development within the club. Provision of Practical Coaching Assistance. Assessment and review of the programme. The first 3 objectives must be completed within 6-8 weeks for the programme to be effective. Phase one should be facilitated by at least one tutor. It is also mandatory that the club executive should be actively engaged in the process. Part of this section will require the coaches to conduct a S.W.O.T. analysis. In the follow-on Phase 2 section the collective opinions should indicate the coaching priorities that the club are going to implement for the year. A time framed action plan with specific objectives and responsibilities should be produced. In Phase 3 the club can avail of our Coach Education Tutors to facilitate or deliver a practical field-based session or any other appropriate coaching related activity. Phase 4 is the practical review and assessment of the programme. This is conducted by the County Games Manager and the original appointed Tutor. Both will meet with the Cub Coaching Officer and the Club executive to decide the outcomes. 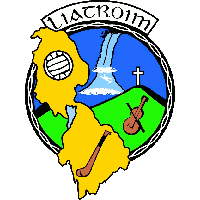 Each Club that is accepted on the programme may avail of a grant to the value of €1000.